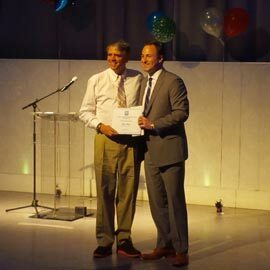 Wilfrid Laurier University’s Director of Residence, Chris Dodd, received the Award of Excellence at the Ontario Association of College and University Housing Officers (OACUHO) annual spring conference June 10 at York University. The award is presented annually to an individual who has demonstrated a high level of commitment and outstanding leadership in the field of housing at their institution while also providing exemplary service to students. Dodd has become a leader in student affairs since coming to Laurier in 1999, and has played a large role in establishing the direction of Laurier’s residence operations as well as the student affairs community in Canada as a whole. Dodd has been able to connect the core function of residence and student affairs to student success. Under his direction, Laurier’s residence operations has been responsive to the shifts of Canadian students’ needs and has become a vital tool for first-year students to transition to university and connect to on-campus resources. Receiving the award was something Dodd did not expect but he is proud that other institutions strive to emulate Laurier’s program. The Ontario Association of College and University Housing Officers is a not-for-profit organization that supports universities and colleges in Ontario on residence and residence facility issues.